June 11 – 14 Great Chenrezig initiation and commentary on nyung nä at The Mines, Kuala Lumpur, Malaysia. Organized by Lapis Lazuli Malaysia. June 17 – 19 Yamantaka initiation at The Mines, Kuala Lumpur, Malaysia. Organized by Losang Dragpa Centre. There are so many unbelievable circumstances for death; it can happen at any time, especially as more diseases such as cancer seem to be increasing. Some people are very happy at the time of death because of their good heart: they experience even death for the benefit of numberless suffering sentient beings, thinking that even at this time this is the best thing that they can do in their life. Other people are not so happy at the time of death, but are OK. Most people, however, are very unhappy at the time of death. Irrespective of the conditions, such as cancer and so forth, the state of your mind is the actual cause of happiness and suffering, even at the time of death. Scribe: Ven. Roger Kunsang, edited by Dr. Nick Ribush. Indonesia, February 7, 2010. Materials Available: The pith instructions given by Lama Zopa Rinpoche for how to care for the dead and dying as well as how to approach this time oneself can be found in the compendium volumes of Heart Practices and Heart Advice for Death and Dying. Other pertinent information is available on FPMT’s homepage. We have some new, fabulous clips at Lama Zopa Rinpoche Videos, which includes the inspiring “Lama Zopa Rinpoche’s Visit to Tsopema, India March 2009” and “Lama Zopa Rinpoche and Ultimate Cooking Lesson, USA, September 2009” – which illustrates the gourmet’s gateway to enlightenment. Watch the video report of the FPMT’s delegation to one of its key projects, the Amdo Eye Center in Xining, capital of Amdo. Filmed in August 2009, it shows the state of progress with the hospital building and its amenities – almost near completion! Living in the Path: Module 1, “Motivation for Life,” is now available on the Online Learning Center and is free to all! If you have not created a login you will need to do so to access the site. Once you have logged in, the enrollment key for Module 1 is motivation03. We are hopeful that all five modules of Living in the Path will be available by August, all drawn from the Light of the Path teachings, 2009. Over time, program content will continue to expand with more materials of both Lama Yeshe and Lama Zopa Rinpoche being added as new modules. For now please enjoy this first module. A separate CPMT listserve message has been sent to all centers explaining about the program and how to host it in the centers. If you need this letter re-sent, please let Merry Colony know. Note for those planning to attend Light of the Path, 2010: “This is what I spoke about this time, mindfulness. Next time that is the beginning that everyone has to know. It is what the retreat is, and then on the basis of this – renunciation, bodhichitta and right view. 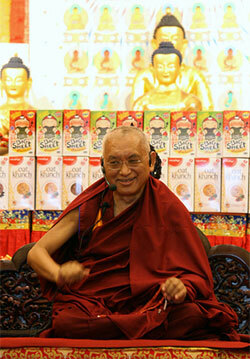 This is what I want to say, then I will go straight to the commentary.” Lama Zopa Rinpoche. Basic Program: Extensive updates have been posted. English updates include the revised and updated study manual for Ornament of Clear Realization, Chapter 4 – a major work done by Masters Program students Ven. Sangye Khadro and Sally Ong. French updates include the translation of the root text of Mind and Mental Factors and Spanish updates include the special insight section of the Middling Lam-rim. Two BP students from Tse Chen Ling, San Francisco, have successfully completed the BP final exam, making TCL the fifth center to have BP graduates. Many thanks to Geshe Ngawang Drakpa who so has so kindly taught the BP at TCL over many years. ABC in Singapore is next with some 30 students now reviewing in preparation for the final exam. Chenrezig Institute will be hosting the first of a series of annually recurring one-month lam-rim retreats (mid-June to mid-July), led by Ven. Thubten Gyatso (Dr. Adrian Feldmann) offering a wonderful opportunity for all, especially BP students from Oz and beyond, to fulfill the BP retreat commitment. NEW! Prayer to the Six Syllable Great Compassionate One. At the request of Rinpoche who said, “this is a very important practice of Chenrezig,” we now have available this lovely prayer/practice of Chenrezig translated by Rinpoche. Coming very soon! The long awaited Buddhism in a Nutshell “Homestudy” program is now at the printer and will be available from the Foundation Store in mid-March. The 241-page book Buddhism in a Nutshell, Essentials for Practice and Study contains short edited transcripts from Lama Yeshe, Lama Zopa Rinpoche and Ven. Amy Miller on all the essential topics ranging from an introduction to the Buddha and his Dharma up to the qualifications of a teacher, emptiness and tantra. An audio program on MP3 disc of Ven. Amy teaching these topics is included. It was designed to be an excellent resource for new teachers, study groups without teachers and individuals who cannot make it to a center. Centers take note: Education Services is happy to make print-ready files available to centers for local printing. We only ask a small royalty fee of all retail sales. This will save you shipping costs and will provide more income for your center’s important Dharma works. Australia has now begun local printing of Refuge in the Three Jewels. Think about it! Wondering what’s been done in the field of FPMT translation? Check out our new resource list of FPMT translations in Spanish, French, Italian, Portuguese, Swedish, Russian, Mongolian and more! Our French translation office has even set up their own website to keep French speakers up to date. At the last CPMT, the topic of how FPMT groups should make better use of all the new media opportunities was raised, although regrettably, there was insufficient time to share and learn from one another’s experience. There was a recognized need for FPMT groups to have more frequent and effective communications with one another. (Currently, a couple of regional groups like FPMT Australia and FPMT Europe use intranet to enable members to post messages and share their news). Beyond that, the avenues of communication enabled by social networking provide the means to greater visibility and access to hitherto untapped audiences. Mandala’s April-June 2010 issue, “THE PRECIOUS AND WISH-FULFILLING HOLY OBJECTS OF FPMT” is the fifth in a series of issues dedicated to telling the story of FPMT. This edition in the series focuses on the holy object activity of FPMT. Filled with photos, stories and history related to FPMT’s work in the area of holy object creation, including extensive information about the Maitreya Project, an initiative to build a 500-foot (152.4-meter) statue of the future Buddha, Maitreya, in Kushinagar, India. Mandala Publications has its own Facebook and Twitter pages! Rinpoche recently spent some five weeks in Indonesia and Singapore, granting the second year of his commentaries on the Lama Chöpa and Ganden Lha Gyalma practices, respectively. Many students from the West made special effort to attend, recognizing the preciousness of those lineage events. teachings as they happened. Being able to read and hear Rinpoche’s teachings at the same time helped to reinforce their impact, reported students who found it especially helpful as an antidote to sleepiness in the small hours of the morning. 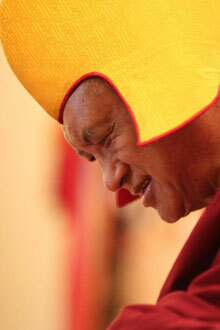 “The presence and teachings of our beloved teacher, Kyabje Lama Zopa Rinpoche, has been truly inspiring for all of us. For over two weeks, we had the incredible fortune to have Rinpoche grant the Guhyasamaja initiation followed by a continuation of the commentary of the Lama Chöpa. Rinpoche spoke at great length on the importance of guru devotion, the four preliminaries, causal and resultant refuge, bodhichitta, emptiness of I and phenomena, and the practice of tantra. More than 100 people attended the teachings, including some 40 foreigners, comprising 23 Sangha members and lay persons from various countries, such as Malaysia, Singapore, Chile, Spain, the US, Belgium, Mexico and Switzerland. We also had the fortune to have many holy relics displayed during the gala dinner and public teaching event, where hundreds of people could circumambulate and make prostrations. During the public dinner, Rinpoche mentioned that it is very important to bring back the Buddhism that Lama Atisha learned from Lama Serlingpa in Indonesia. Rinpoche offering a khata to the Prajñaparamita statue at the museum in Jambi. Chinese New Year to hold two animal liberation events, saving 1.3 million lives from cooking pots and the lower realms! …the County of San Diego is committed to recognizing and honoring those events that are dedicated to the best ideals of public service and the tour of the JADE BUDDHA FOR UNIVERSAL PEACE is one such worthy occasion”. 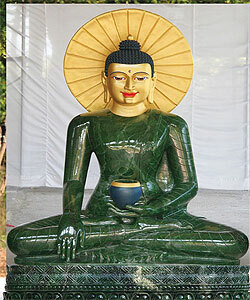 Say hello to the Jade Buddha when he goes to a city near you! Mongolia Suspends the Death Penalty – Rejoice! FPMT Mongolia was among those who sent their congratulations to the Mongolian President, Mr. Ts. Elbegdorj, for his compassionate decision to suspend the death penalty in the country. Firstly, Mongolia is a Buddhist country that is independent and democratic. If our country abolishes the death penalty, our country’s prestige will be raised at an international level. Also, as Mongolia is in the process of establishing a democratic society, the national identity of being a Buddhist country will be strengthened. Secondly, according to Buddhist doctrines, taking a human rebirth is very rare and much more precious than a wish-fulfilling jewel. It is really much more precious than many hundreds of billions of dollars, because with a human rebirth, together with strong regret and the correct instruction, there is the great potential to purify any kind of heavy and negative misdeeds. Therefore, it is an incredible loss to a person, who has committed a heavy negative crime, to be denied this opportunity of purification and transformation of the mind. Based on this reasoning, we encourage the inmates to think of their sentence as that of an isolated retreat and to utilize this time well for the study and practice of Dharma and meditation to make amends for their mistakes. Thirdly, as Buddhists we try our best to abstain from negative deeds, to accumulate virtues and to purify our misdeeds, those that we can remember and those that we cannot, since the negative deeds are the cause of all suffering and the virtuous deeds, the cause of all happiness. Therefore, it is exactly in accordance with Buddhadharma, as well as beneficial for their future life times, that people who have committed serious crimes should be spared the death penalty and instead, have the opportunity and supportive conditions to practice the Buddha’s methods to purify their heavy negative deeds. Fourthly, according to Buddhism, there is nothing that is outside of karma, the laws of cause and effect. If we analyze the death penalty based on these laws, this is not the proper or skillful means to stop heavy crimes, but instead will bring greater suffering to our people and country. Based on these reasons, we, the administration and all staff of FPMT Mongolia, are very happy with Mr. President’s call to end the death penalty and wholeheartedly support it. Milarepa Center, Vermont, USA is currently accepting applications to their work-study program. Benefits include the opportunity to support their summer programs, highlights of which are a Kalachakra initiation with Choden Rinpoche and a series of eight nyung nä practices at Saka Dawa. The retreat center set on 300 beautiful acres is also looking to engage an experienced vegetarian cook. For more information and to apply, please contact Rosanne Hebert, Administrative Manager for more information. Mahamudra Centre at Coromandel, New Zealand has vacancies for a vegetarian cook, a groundskeeper and a housekeeper. For details, please contact Ven. Tenzin Nangsel (Bernice McCombie), Center Director. Please check out the many exciting opportunities to offer service in FPMT centers around the world!